Protective Packaging Corporation is one of the leading manufacturers of static shielding & ESD bags in the United States. Although we carry “ready-made” bags, our manufacturing facility gives us the ability to create customized static shielding bags of any size, from a 2 inch square to over 200 feet long. Call to order ESD bags at 1-800-644-4032, or order rolls of ESD material online. We have some overstock ESD bags here for purchase online. 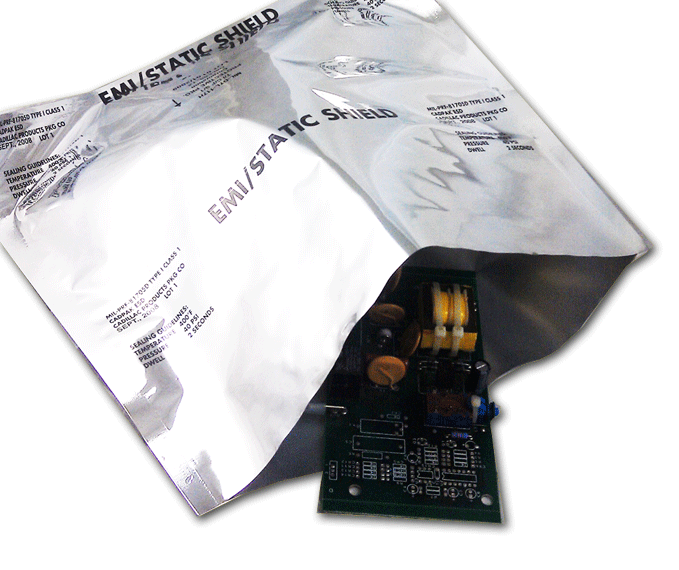 We Make Static Shielding & ESD Bags of All Sizes! Standard flat bag dimensions available for order are listed below. Bags made from Protect STAT 100M and Protect SS are available with zipper closures. Bags from all materials can be heat sealed. If the size you need is not listed above, DON’T PANIC! Just call us at 1-800-644-4032 and tell us what you need and we will make it. All of our bags are made with metal-in static shielding materials which offer superior durability at a low cost. Enhanced durability is obtained with the metalized layer buried between the polyester and the polyethylene layers of the metal-in shielding. The metal-in layer prevents the penetration of damaging electrostatic fields. Tribocharging is minimized by specially processed, non-static-generating polyethylene. This type of bag is recommended when packaging static sensitive components.